What You Need To Know: PWM and MPPT Solar Charge Controller. Chris Warren December 23, 2015 December 23, 2015 20 Comments on What You Need To Know: PWM and MPPT Solar Charge Controller. The solar charge controller is arguably the most important component of a solar energy system. Like the conductor of an orchestra, the solar charge controller makes it possible for all the other parts to work together. Understanding how a solar charge controller performs its task is important to planning for your own off grid energy needs. Solar panels greater than 20 watts or so generally cannot be directly connected to a load because the voltages they produce are not compatible with most batteries and equipment: A “12 volt” panel can go as high as 17-19 volts in bright sunlight. And an obvious problem exists when you have a 24 or 48 volt solar array and a 12 volt load. A proper solar charge controller will take care of all these issues. Why can’t they just make solar panels that produce the correct 12 volts? The nature of solar panels are that output can change quite a bit according to light levels, temperature, and many other factors. With current technology there is no such thing as a solar panel that will produce a stable voltage at all times, under all conditions. To get around this problem, solar panels are designed with a lot of extra wiggle room to allow for poor operating environments. Just as it would not be practical to have a car with the engine connected directly to the wheels, solar panels need a go-between to smooth everything out. The solar charge controller is to your off grid power system what the transmission is to your car. Pulse Width Modulation (PWM) is the most common, least expensive, and easiest to deploy solar charge controller technology. Often incorrectly referred to as DC to DC converters, they are really switches similar to a switching power supply that match the source voltage (solar panel output) to the load voltage (usually a 12 volt battery). 13.5 volts x 7.63 amps = 103.005 watts. In our real world example above, a standard PWM charge controller will give up over 30 watts of otherwise useable power. That is an immediate 24% loss before any other factors are included. The chart below for a 12 volt system shows the main disadvantage of PWM devices. Notice that the maximum power point (MPP) of the panel is well outside the voltage range of the controller and is too high for amateur radio use. The strip of space between the left edge of the greyed area and the vertical dashed line represents throwaway power. Even though a PWM solar charge controller will have an inherent inefficiency, they are very affordable and by far the most popular choice for amateur radio operators. Their simplicity and price make the energy tradeoff an acceptable compromise. So if a solar panel’s MPP is at a voltage that is not useful, and we don’t want to give up wattage as the consequence of pulling voltage down, what are the options? What if there was a way to “move” the MPP down into the working range of the system? Since we are bound by a fixed voltage of around 12-14 volts, the only way to slide the power point down is to raise the current up (Ohm’s Law). MPPT is the solution. Maximum Power Point Tracking (MPPT) solar controllers are more than just a passive switching circuit regulating a voltage output. MPPT devices have on board computers controlling a complex system of semiconductors and gates that convert solar-produced DC to high frequency AC and then back to DC. As the sunlight changes, the MPP is constantly changing; the microprocessor does the math and adjusts in real time. MPPT solar controllers typically pass on to the load over 90% of the incoming energy. In an MPPT solar controller it is possible and even desirable for the output current to be much higher than the input current. Example: The Morningstar Tri-Star 45 MPPT solar charge controller can handle 45 amps. At 12 volts, that’s a maximum of only about 540 watts. However, if we reconfigure our panels for 24 volts, we immediately double the capacity of the controller to over 1000 watts. Remember that current is inversely proportional to voltage, so if the voltage doubles, the current is cut in half. This is one way MPPT gets the most out of your panels. By reconfiguring the solar panels for 48 volts, the current is cut by another half and the capacity approaches 2400 watts, the maximum the solar charge controller can handle. This whole time the output to the batteries is the same 12 volts that hams need. You cannot do this with a PWM solar charge controller. PWM has fixed voltage and current values. Once the limits are reached, you are done. MPPT does have its share of drawbacks. First, the expense. An MPPT solar controller will cost double or more than its comparable PWM version. If your solar panel capacity is less than 350 watts and you don’t foresee expanding, you will not get enough out of an MPPT solar controller to make it worth the money. It would be more cost effective to go with PWM and use a larger (or additional) panel to compensate for the power loss. MPPT controllers are also typically less mechanically robust than PWM models. They are, after all, computers with circuit boards and tiny surface mount components. They are meant to be mounted in an indoor stationary location with some degree of climate control. I recommend against using an MPPT solar controller in a motorhome/trailer, boat, or any environment where vibration, heat, or humidity might be an issue. The technical complexity that makes MPPT efficient and flexible is also a point of failure. PWM controllers aren’t as fussy. Many of them have the internal circuitry encased in epoxy resin; to physically break them would almost require willful abuse. Cannot be used where solar panel voltage is different than load voltage (ie, will not work with 24 volt panel and a 12 volt battery). Inefficient -expect a 10-30% power loss through the controller. not very scaleable. Limited to a fixed voltage and current. Some MPPT models have an Ethernet port so you can adjust settings and monitor performance through your home computer. Maximum Power Point (MPP): The maximum voltage and current that can be produced by a solar panel under any given conditions. On a graph, this would be where the x axis (voltage) and y axis (current or wattage) intersect. MPP can change constantly according to environmental factors such as sunlight and temperature. Maximum Power Point Tracking (MPPT): An active controller technology that uses algorithms to compute the MPP of a solar panel at any given instant and through software drive a series of switches and gates to maintain the MPP within a defined voltage range even as the input varies. Pulse Width Modulation (PWM): A passive controller technology that uses solid state switches and gates to produce a steady DC output from a varying DC input. This well written white paper (click here) goes into great detail about the technical aspects of solar charge controllers. I have PWM and MPPT solar charge controllers and both formats are excellent performers when used within their intended design parameters. There is no clear good or bad option, just a series of choices and trade offs. Pingback: What You Need To Know: PWM and MPPT Solar Charge Controller. Great article about solar battery charging. Thank you so much for the feedback, Arne. Off Grid Ham is a relatively new website. I think I’m filling an underserved need in the ham community. I hope you’ll come back again and bring a few friends with you. You can also subscribe to my blog via email by filling out the form on the right side of every page. Hi Cj…an MPPT controller will maintain a steady output as the light level is reduced, but as you mention the current will also go down accordingly. Of course at some point the controller output will go to zero and the device will shut off. If your array is “12V” nominal, the panels can actually put out up to 18-ishV at peak conditions. But as conditions get worse, both voltage and current output drop. The panels are still making current, but at a lower voltage…at some point that voltage isn’t high enough to actually push charge to your batteries (usually >13.5V). Energy is being produced, but can not flow. Enter MPPT, which turns high voltage/low current into lower voltage/higher current. What this lets you do — aside from extracting more usable energy from the panels as the article already explains — is to continue to get energy out of them even in poor conditions, IF you have a higher voltage array. 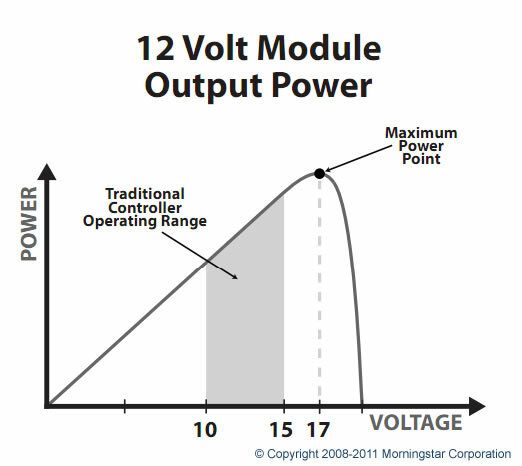 A “24V” array, even in crummy overcast weather, can still be putting out voltage in the high teens…and the MPPT controller will happily step that down to the 13.5V your batteries need to charge. It won’t be much…but it’s still /something/, and that can make all the difference. I have a 1200W array @ 48V, charging a 12V battery bank via MPPT, and i have seen 150W coming into the batteries during overcast, rain, and even snow! The power point tracking is important, but extracting a few precious watts out of an overcast drizzly day is where the money is, imho. Hi Jerud, you make a lot of great points. My MPPT system will also crank out a surprising amount of wattage under poor conditions. As my article explains, whether that is “worth it” depends on the size and dynamics of the system. A 1200 watt array such as yours is rather substantial, so you are definitely getting your money’s worth out of MPPT. Thanks for stopping by Off Grid Ham. I hope you’ll come back soon. be impeccable with your words articles thank you. Do you have a recommendation for a solar charge controller that does not produce a lot of RFI? I want to deploy a 100W panel + charge controller, hook it up to a 12v car battery, and use it to power my mobile HAM radio (while the vehicle is off). 2. It’s not a car battery–it’s two group 34M batteries in a dual battery system. 3. The mobile is actually an ID-5100a configured as a crossband repeater, and hitting it with my ID-51A HT LOL. Hi, Christopher. It’s funny…I get a lot of questions about potential charge controller RFI but very rarely hear of anyone who has actually had this problem. Maybe it’s a leftover legend from the days when charge controllers were not as refined a they are now? Anyway, I use an older version of this for my portable setup and have had great success with it: MorningStar 10 Amp Controller. I buy most of my stuff from Northern Arizona Wind & Sun and highly recommend them. Basically, almost any reasonable controller will give you the results you’re looking for, and by “reasonable” I mean not the $14.00 controllers from Harbor Freight or Amazon. I hope I’ve been helpful, Christopher. Thanks for your question and I hope you stop by Off Grid Ham again. 73. I have the older 10 amp Morningstar, but I didn’t modify it as per the instructions to “reduce RFI”. So, it is not a myth, RFI is normal with the MPPT controller as the processor switching creates it. It is in the instructions that you WILL experience it. The modification recommended will reduce RFI and the efficiency, so I opted to alternate battery banks. Charge the one I’m not using, use the one I’m not charging. It has been several years and no problems. Just maybe the reason you don’t hear complaints is people are smart enough to work around it. Morningstar support is worth the extra dollars if “top of the line” is in the budget. I built a digi repeater system with two transmitters/receivers, TNCs, etc with one big gel cell and used a $10 MPPT from Ebay, almost three years trouble free. The controller is mounted out of direct weather, but is in the open, it keeps on ticking. I’m building a 300w system and thinking about the controller again. This system has no way of avoiding low light conditions ( shade ). Always used MPPT so far and looks like that will be the choice again. Before I purchase I still read up to see if things have changed. Thanks for your article! In your examples you stated that by increasing the voltage from 12v to 24 v off the panels the wattage jump would be from 540 to 1080. Given that we’re charging a 12v battery the wattage restriction would still be 540 watts for the mppt controller as the Tristar can only output 45amps. Your calculation would be true if we were charging a 24v battery system as 45amps x 24v=1080watts. If we plugged a 1000w array to this controller and tried to charge a 12v battery off it the array would produce over 80 amps. 1000w/12v=83.33amps. The controller would be toast. The same would hold true for the 48v system. We can use higher voltage panels but because we’re charging a 12v system we’re still stuck with the controllers amperage restriction. Hopefully I’m not stepping on any toes but just wanted to point out the clerical error. Love the website btw. Hello! You’re not stepping on any toes, but I do think you misunderstand how MPPT controller technology works. The 45 amp rating refers to the input of the Tri-Star, not the output. The controller used in this example will go to 45 amps at any of its rated input voltages and will always convert the input to a steady 12 volts output with very little energy loss. If you have 12 volt panel cranking out 45 amps, that would give you the quoted 540 watts going to the 12 volt battery. However, if you had a 24 volt panel producing 45 amps, the potential output goes to 1080 watts (into the same 12 volt battery). This device will go to 48 volts input with the same 45 amp limit, which means it tops out at about 2100 watts. One of the benefits of MPPT technology is that you can keep bumping up the input voltage to make better use of the current limit (in this case, 45 amps) and still keep your 12 volt battery. Also, just because a solar panel can produce more current than a controller is rated for does not mean the controller will be “toasted”. To use your example, the panel will not produce 1000 watts unless there is a load on the other end pulling 1000 watts. So simply hooking up a huge panel to an underrated controller does not automatically end in a mass of charcoal. In my home system, my solar panels could easily overwhelm the controller, but I don’t worry about it because I know the load will never exceed the limits of the controller. I hope this explanation is helpful and that you’ll stop by Off Grid Ham again soon. 73. It depends on the size of the solar panel,not the type of controller. Have you looked at the recent developments in some of the MPPT’s (July 2017)? Morningstar makes an epoxy encapsulated MPPT (Morningstar Sunsaver SS-MPPT-15L) which is similar to the excellent Tristar MPPT they make. Also Victon Blue Solar makes marine versions of the Blue Solar MPPT’s, all or most of which are also epoxy encapsulated, and they come in various abilities, solving, for many, some of the issues of RV/Marine use of MPPT’s -and tested in the field with many reviews on places like Amazon. -I’m just a consumer found your site looking for RFI issues with PWM vs MPPT’s, looking to buy gear! Thanks, just found your site and am looking around. I think i want to get licensed but am still trying to figure out if it’s doable for me. I’m off grid /and/ mobile in an RV (no hookups, “boondock” camping only). I’m trying to determine the power requirements for running this equipment, what kind of setup would make sense, how much space it takes up (! ), and how big a role antennas play (potentially tricky for a mobile install). If you have any links you’d like to point me in the right direction, i’d appreciate that. Hello again Jerud, Amateur radio in an RV is very doable. As always there are compromises but many hams are successful at it. If you want to operate while the RV is parked then you have more options. I’m not an RVer but I do operate portable a lot using only equipment I carry in a backpack. I don’t know of any links for websites specific to your issue; I suggest searching YouTube and reading Off Grid Ham articles about QRP and portable antennas. Thanks again and 73.